News orgs, listen up: make it EASY to contact you! I don’t so much mind that newspapers are dying — it’s watching them commit suicide that pisses me off. Well, I do mind that they are dying. And I’m really pissed off when they demonstrate cluelessness that contributes to the death watch. I went to the Denver Post to read about the Aurora shootings. I try to support local media in times of national news attention. I looked through the sidebar links, trying to find the “special” page, the “portal” to full coverage. Found it at the bottom of a (long) information sidebar. What do you think happened when I clicked that link? I looked at the link – photos.denverpost.com/theatershooting – and deduced that the problem was probably that “photos” server name. 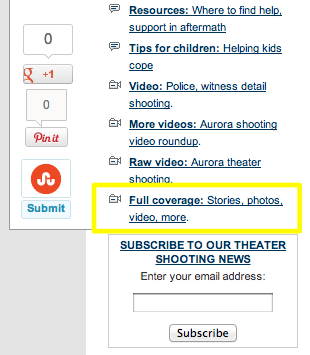 Sure enough, denverpost.com/theatershooting works. I look for a Twitter ID for the newspaper or the reporters, like this from O’ReillyRadar. Nothing. I scroll up and down. There are two comments – OK, I’ll add one. This broken link is in your main story navigation – very bad because that means it’s 404 everywhere on the site. If I could find a Twitter account for the paper on this page, or an email address for a reporter, I’d try a more direct form of contact. O.M.G. I have to register to comment. Get real, DenverPost! Make it easy to talk to people. I typed that because I can’t use Disqus or Twitter or even (I can’t believe I’m typing this) Facebook to log in. I. Have. To. Create. An. Account. Eventually, after starting this process, I stop the page scroll at just the right point – I also see that the reporters have Twitter accounts. How would I redesign this page? First, I would create an author block that is visually distinctive. I like them at the top but can live with them below the story. Second, I’d be consistent in how I present reporter info. Look at my screen capture; see how the contact info for the two reporters differs? Jarringly? And look at the (very) odd use of white space. Third, I’d add photos of the reporters. Yeah, I know it’s traditionally been something that only columnists used. Get over it. Fourth, I’d make the paper’s Twitter account prominent. It’s great that the Denver Post makes it easy for us to share their stories (that’s what they want us to do, so it’s prominent). But they should also make it easy for us to contact them. Fifth, I’d put the contact info in a bounded area — footer is the most logical. There’s a great big white space to the right of “more headlines” just below the horizontal footer. Contact info could include main Twitter account, Facebook, email, phone and a link to social page with all reporters. For example, how do you get to this “denverpost.com/twitter” page … except by starting with @DenverPost? Sixth, I’d change the commenting system and make it more accessible. Maybe I’ll do a mock up. I did send a tweet to both reporters.